Turbulence Ahead: Negative Equity: So What? Does negative equity matter? Of course the answer is an unqualified 'yes' for those individuals and their families living in properties worth less than they owe. But does the issue of negative equity matter for the wider economy? The answer, as usual, is that it depends. Firstly it depends on the incidence and scale of negative equity. Ronan Lyons has used a number of different data sources to suggest that one in five homes in Ireland are in negative equity. I think this is the upper limit: my own research has found that 15% of mortgage holders describe themselves as being in negative equity: but only about half of all home owners actually have a mortgage. So the lower limit could be 7-8% of all households. That's the incidence - but what about the scale of negative equity? Bank of Ireland's preliminary results contain some sobering statistics about negative equity (reported in the 'accompanying presentation': slide 18). The bank estimates that 12,200 of its mortgage holders are in negative equity. The precise basis for the calculation isn't clear (though obviously it involves what was originally paid for the properties involved - adjusted for the trend in house prices since then - less the amounts outstanding). 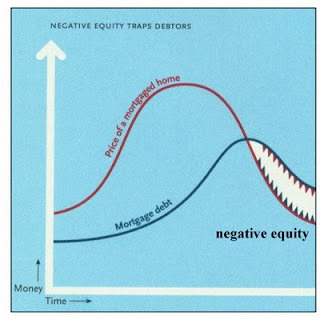 The Bank's analysis reckons that the 'negative' value of the negative equity (i.e. : what these 12,200 mortgage holders would be left owing if they all sold tomorrow for the estimated current price) is a total of €355 million. That's a lot of money but ... it works out at €29,000 per mortgage holder. Not quite the end of the world or the road to financial ruin for life: more like the cost of a family car loan that could be repaid over 5 years. negative equity only becomes a financial liability if and when the home owner sells: up until that point it is a matter of opinion rather than fact. So what could be the wider implications for the economy of negative equity? Obviously in the first instance it will slow down certain parts of the housing market - especially the sales of properties that would be the 'natural' next purchase by, say, first time buyers now 'stuck' in smaller properties than they would like (for example when they start to have children). But not all mortgage holders in negative equity are living in one bedroom apartments. Many are in perfectly adequate family homes that should suit their accommodation needs (if not their lifestyle ambitions) for the foreseeable future. Long enough, indeed, to see house prices come back to a level that offsets their diminishing mortgages (as they continue paying them down). So the negative impact of negative equity will, at worst, be confined to those unfortunate few who have no choice but to sell their properties for less than they owe and, probably, take out personal loans to pay off the shortfall. Such loan repayments will add nothing to the economy as such (unlike, say, loans taken out to buy a car or furniture): but nevertheless we are talking about a marginal impact on aggregate consumer demand. One thing we can be grateful for in relation to the behaviour of our banks during the boom (make that the only thing) is that we never got to treat our homes like ATM machines, the way US and even UK home owners did. There, negative equity is a far more serious issue in terms of both its incidence and its wider economic impact. Especially as US consumers seek to deleverage their domestic balance sheets at a record rate. For those Irish mortgage holders experiencing negative equity, the best solution may simply be to wait - especially if their homes meet all their genuine accomodation requirements for now. And in the meantime, just don't lose your job, become ill or get divorced ... which probably goes for all mortgage holders come to think of it. There are some issues with your discussion and the experience of home-owners "sitting out" the negative equity. Firstly we don't know how long it will take for home prices to recover. Given that this bubble was unprecedented, chances are it could be more than the 10 years your quote for London. Secondly, our model of home ownership is heavily reliant on "trading up" i.e. home owners don't buy [properties in which they intend to live for a long time. You start with an appartment, move to the starter home and so on. What happens, then when this cycle breaks? Finally many of the houses bought over the past decade will never recover their value since they were built in the wrong place and were severely dependent on car based commuting (this includes one off houses). 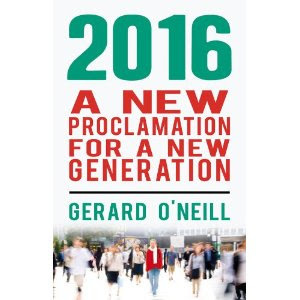 Great post Gerard, but as I remarked to Ronan recently, though the percentage of those who could actually experience negative equity is relatively low, given the scale of the down turn here, the devil is in the detail---these are either young people whose credit ratings will be shot if they hand in the keys, older people who sold up and traded up or down, or investors looking to flip. I don't feel too sorry for any of these classes of people, but it does impact consumer confidence and expectations about the future, which hammers domestic consumption, thus deepening the slump and encouraging yet more negative equity. Keynes in chapter 11 of GT has a great section where he talks about how future expectations are made in different periods, boom and bust. I'd love to have the updated version for the Irish case. This is interesting gerard but we need to approach this differently. When things like dioxin and so on are happening, it is often good to have someone to put things in perspective so people dont get carried away with what is in actuality a small risk. What you are doing here I suppose is putting negative equity in perspective and pointing out that its economic size relative to aggregate demand is low given the housing structure of the Irish economy. The problem is that nobody seems to care about this issue anyway other than some nervous banks and some fraught young householders. A lesson in economics is maybe what some of these guys needed and its what they are going to get though its a lesson that (in the Irish legal system) they may never recover from. The assumption that these householders will keep diligently working away for the rest of their lives to pay back a mortgage substantially larger than their declining incomes is something that should be looked at. We need someone to really focus on these people (your figures suggest this could be as low as 5 per cent of householders but I really think this is a rosy scenario - even Ronan's figures assume roughly that current prices are accurate valuations) who are in seriously distressed financial positions. We need to examine closely how the banks are dealing with them. Remember when you are in negative equity your bank essentially has monopoly power over you and this requires very close regulation to avoid bad outcomes. Also, there is a lot of regional bunching in this which has effects that are unpredictable. Whether this group is 5 per cent or 20 per cent of the population is of course important from an aggregate perspective. But even if it were only 1 per cent it needs to be addressed. I should point out that I am permanent public sector employee and I rent so its unlikely that I am getting carried away with this due to personal risks. I am currently living in a home that it in neegative equity. Myself and my partner have decided to part and now there is an unresolved issue regarding the house. My partner has a full time permanent job and doesn't want to take on the responsibility of the house. I lost my permanent job a few months ago and am working part time at present. The bank have refused to give either of us a personal loan to cover the negative equity if the house is sold! We have suggested paying them back over a number of years, but they wont agree to it. Even if my partner comes up with his portion of the negative equity, I have no way of coming up with mine. This leaves me in the situation of trying to take over the house on my own as selling is not an option due to the bank.